Nissan is keeping it low-key, but the brand will return to the Detroit auto show in January. A year ago Nissan provoked gasps when it pulled out of Detroit, citing cost and the industry's plunging profits. Since then, Nissan officials have talked about a fresh approach to showcasing products that might not include the big auto shows. Nonetheless, Nissan agreed to return to Detroit for 2010 to participate in an "Electric Avenue" exhibition. 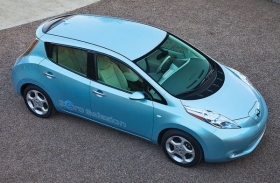 Nissan will display the upcoming all-electric Leaf alongside some of the industry's other electric-powered vehicles. One Nissan staffer says the display area will be about the size of three or four cars and cost "a fraction" of what Nissan has spent on big Detroit booths in the past.